Snood: part scarf, part hood, part shawl. We present two snoods: one in knit and one in crochet. They can be worn in a million different ways, which is why they are so loved by those who wear them. Because both of ours are created as Möbius strips, not only do they have a luxurious twist, you will find that the way in which each snood comes together as you work them seems just a little bit magical, especially if you have never created a Möbius before! 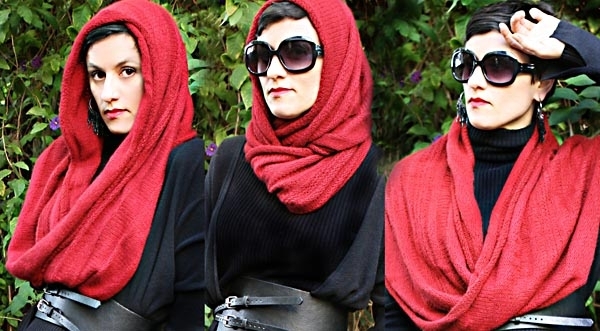 Alchemical Snood (Knit - pictured in Red and White): What do you get when you combine a Möbius strip, the fibonacci sequence, and this season’s hottest accessory? 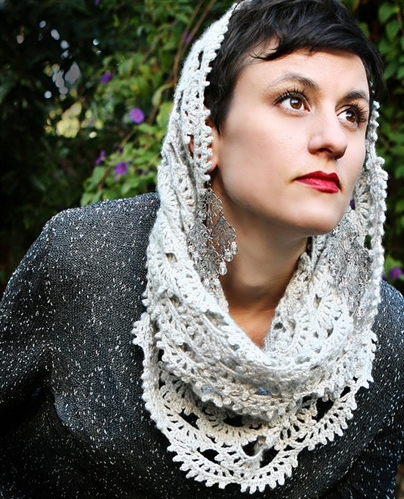 It’s more than a mathematical wonder, it’s the Alchemical Snood! Once you master the Möbius Cast-On (MCO), popularized by Cat Bordhi, this project is a simple matter of knit and purl rounds: a great project for mindless, on-the-go knitting. 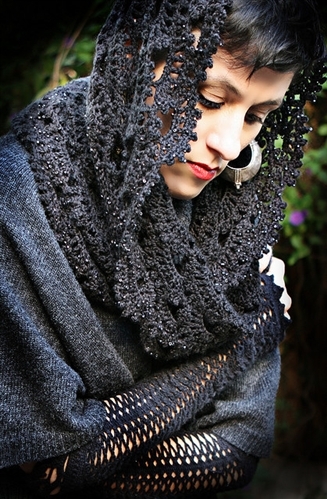 Crystalline Snood (Crochet - pictured in Grey and Black): This delicate lace concoction looks very complex, however it is just a simple repetition of a two-row lace pattern repeat. This crocheted Möbius strip is worked in the round from the center - out.